With the advent of the Internet and an increasing acceptance of LGBT people across the Western world, the relevance of gay bars in the LGBT community has somewhat diminished. In areas without a gay bar, certain establishments may hold a gay night. In Berlin, there was gay and lesbian night life already around the year 1900, which throughout the 1920s became very open and vibrant, especially when compared to other capitals. Especially in the Schöneberg district around Nollendorfplatz there were many cafes, bars and clubs, which also attracted gay people who had to flee their own country in fear of prosecution, like for example Christopher Isherwood. 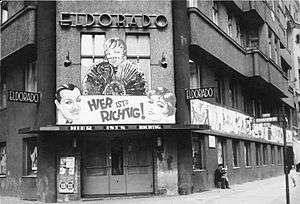 The gay club Eldorado in the Motzstraße was internationally known for its transvestite shows. There was also a relatively very high number of places for lesbians. 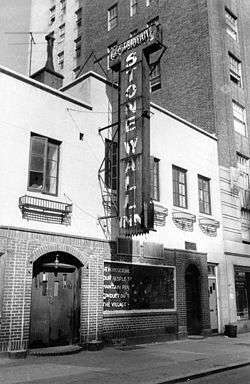 Within a few weeks after the Nazis took over government in 1933, fourteen of the best known gay establishments were closed. After homosexuality was decriminalized in 1969, many gay bars opened in West Berlin, resulting in a lively gay scene. In Amsterdam, there were already a few gay bars in the first quarter of the 20th century. The best known was The Empire, which was first mentioned in 1911 and existed until the late 1930s. 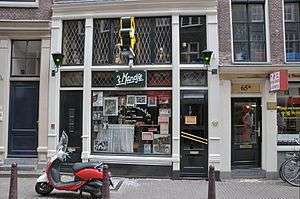 The oldest place that still exists is Café ‘t Mandje, which was opened in 1927 by lesbian Bet van Beeren. It closed in 1982, but was reopened in 2008. Because of the high prevalence of homophobia in Russia, patrons of gay bars there often have had to be on the alert for bullying and attacks. In 2013, Moscow's largest gay bar, Central Station, had its walls sprayed with gunfire, had harmful gas released into a crowd of 500 patrons, and had its ceiling nearly brought down by a gang who wanted to crush the people inside. Nonetheless, gay nightlife is increasing in Moscow and St. Petersburg, offering drag shows and Russian music, with some bars also offering discreet gay only taxi services. Under the dictatorship of General Francisco Franco from 1939-1977, homosexuality was illegal. However, in 1962, Spain's first gay bar, Tony's, opened in Torremolinos and a clandestine gay bar scene also emerged in the 60's and early 70's in Barcelona. The Atlantic House in Provincetown, Massachusetts was constructed in 1798 and was a tavern and stagecoach stop before becoming a de facto gay bar after artists and actors, including Tennessee Williams began spending summers in P-town in the 1920s. Esta Noche was the first gay Latino bar that opened in 1979. It was located on Mission Street and 16th Street. Closed down in 1997 as one of the last gay Latino bar in the Mission District. Because of a raid on a Mexico City drag ball in 1901, when 41 men were arrested, the number 41 has come to symbolize male homosexuality in Mexican popular culture, figuring frequently in jokes and in casual teasing. The raid on the Dance of the 41 was followed by a less-publicized raid of a lesbian bar on 4 December 1901 in Santa Maria. Despite the international depression of the 1930s and along with the social revolution overseen by President Lázaro Cárdenas (1934–40), the growth of Mexico City was accompanied by the opening of gay bars and gay bathhouses. During the Second World War, ten to fifteen gay bars operated in Mexico City, with dancing permitted in at least two, El África and El Triunfo. Relative freedom from official harassment continued until 1959 when Mayor Ernesto Uruchurtu closed every gay bar following a grisly triple murder. But by the late 1960s several Mexican cities had gay bars and, later, U.S.-style dance clubs. These places, however, were sometimes clandestine but tolerated by local authorities,which often meant that they were allowed to exist so long as the owners paid bribes. A fairly visible presence was developed in large cities such as Guadalajara, Acapulco, Veracruz and Mexico City. Today, Mexico City is home to numerous gay bars, many of them located in the Zona Rosa. The first recorded use of the term 'gay bar' is in the diaries of homosexual British comedian Kenneth Williams: "16 January 1947. Went round to the gay bar which wasn't in the least gay." At the time Williams was serving in the British Army in Singapore. In the 1970s, straight nightclubs began to open their doors to gay clients on designated nights of the week. In the 1980s, a lesbian bar named Crocodile Rock opened in Far East Plaza, which remains to this day the oldest lesbian bar in Singapore. Today, many gay bars are located on the Neil Road stretch, from Taboo and Tantric, to Backstage Bar, May Wong’s Café, DYMK and Play. Mega-clubs like Zouk and Avalon are also a big draw for the gay crowd. The oldest gay bar in Beijing is the Half-and-Half, which in 2004 had been open over ten years. The first lesbian bar was Maple Bar, opened in 2000 by pop singer Qiao Qiao. Qiao Qiao also opened another popular lesbian bar, Feng bar, also known as Pipes,which was closed by the police in 2009. The On/Off was a popular bar for both gay men and lesbians. The increase in China's gay and lesbian bars in recent years is linked to China's opening up to global capitalism and its consequent economic and social restructuring. The first white gay bar opened in the Carlton Hotel in downtown Johannesburg in the late 1940s, catering exclusiely to men of wealth. In the 1960s, other urban bars began to open that drew more middle and working class white men; lesbians were excluded. The language of Gayle had its roots in the Cape Coloured and Afrikaans -speaking underground gay bar culture. In 1968, when the government threatened to pass repressive anti-gay legislation, queer culture went even further underground, which meant clubs and bars were often the only places to meet. These bars were often the targets of police raids. The decade of the 1970s was when urban gay clubs took root. 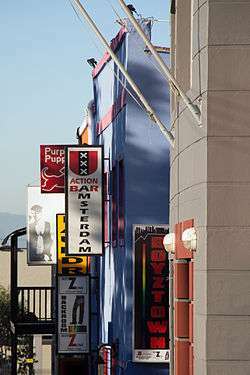 The most popular gay club of Johannesburg was The Dungeon, which attracted females as well as males, and lasted until the 1990s. The 1979 police assault on the New Mandy's Club, in which patrons fought back, has been referred to as South Africa's Stonewall. ↑ Geoff Williams (19 September 2007). "10 Businesses Facing Extinction in 10 Years". Entrepreneur. Retrieved 2008-11-26. ↑ Tim Blanning. The Pursuit of Glory: Europe 1648-1815. p 80. ISBN 978-0-670-06320-8. ↑ Florence Tamagne, Paris: 'Resting on its Laurels'?, in: Queer Cities, Queer Cultures: Europe since 1945, p. 240. ↑ Tamagne, p. 242- 243. ↑ Laurent Jézéquel, "New Moon : comment un cabaret de Pigalle est devenu le QG du rock alternatif", Telerama Publié le 05/10/2015. Mis à jour le 07/10/2015 à 18h59. ↑ Matt Cook. London and the Culture of Homosexuality, 1885-1914 (Cambridge Studies in Nineteenth-Century Literature and Culture). ISBN 0521089808. ↑ "The programme and menu from the Cave of the Golden Calf, Cabaret and Theatre Club". 20thcenturylondon.org.uk. Retrieved 8 December 2015. ↑ "Copenhagen Gay Travel Guide 2014". ↑ "History". Retrieved November 28, 2015. ↑ Kery Murakami (June 23, 2007). "No longer at the center of Seattle's gay scene, bar still serving outsiders". The Seattle PI. Retrieved 1 January 2011. ↑ Press, Berkeley Electronic. """'Mira, Yo Soy Boricua y Estoy Aquí': Rafa Negrón's Pan Dulce and the Queer Sonic Latinaje of San Francisco"" by Horacio N Roque Ramirez". works.bepress.com. Retrieved 2016-04-07. ↑ Hankin, Kelly (2002). The Girls in the Back Room: Looking at the Lesbian Bar. University of Minnesota Press. ↑ Scott Simon (28 June 2008). "Remembering a 1966 'Sip-In' for Gay Rights". National Public Radio. Retrieved 2008-11-26. 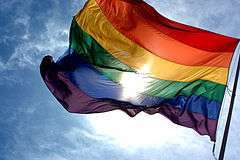 ↑ "America's Oldest Gay Bar, WhiteHorse, Turns 80". Huffington Post. May 21, 2013. Retrieved November 28, 2015. ↑ Coerver, Pasztor and Buffington, p. 202. 1 2 Dynes, Johansson, Percy and Donaldson, p. 806<ref name="Dynes, Johansson, Percy and Donaldson, p. 806"
↑ Herrick and Stuart, p. 141. ↑ The Kenneth Williams Diaries edited by Russell Davies, 1993, 8. ↑ In 1966 (昭和41), There is the continuously operating gay bar "New Sazae" which opened in Tokyo, Shinjuku Ni-chōme. 8 December 2007 ja:出没!アド街ック天国 Shinjuku Ni-chōme. ↑ Independent. February 7, 2010. Retrieved on March 16, 2015. ↑ Sullivan, Andrew (4 October 2005). "The End of Gay Culture". The New Republic. Retrieved 22 January 2013. ↑ Thomas, June (27 June 2011). "The Gay Bar: is it dying". Slate. Retrieved 22 January 2013. ↑ Williams, Geoff (19 September 2007). "10 Businesses Facing Extinction in 10 Years". Entrepreneur. Retrieved 22 January 2013. ↑ Jones, Carolyn (May 9, 2013). "Oakland's White Horse gay bar turns 80". San Francisco Chronicle. Retrieved November 28, 2015. ↑ "Night. Life.". Gay Bar Culture. 2008. Archived from the original on September 12, 2008. Retrieved 2008-11-26. ↑ Bendix, Trish (17 August 2015). "Broadly goes to "The Last Lesbian Bars"". AfterEllen. Retrieved 22 October 2015.